Today, we have the best recipe for leftover turkey that is so easy to make!! 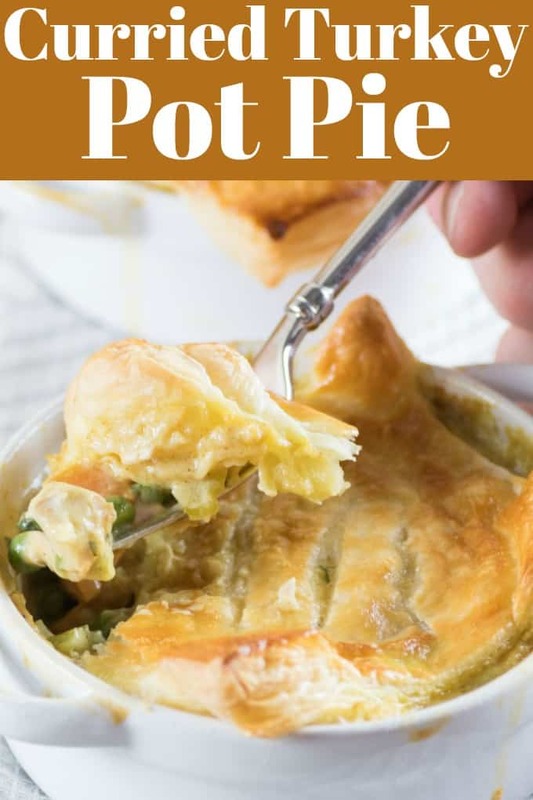 Curried Turkey Pot Pie is pure homemade goodness and it is from a series of cookbooks that I know and love. 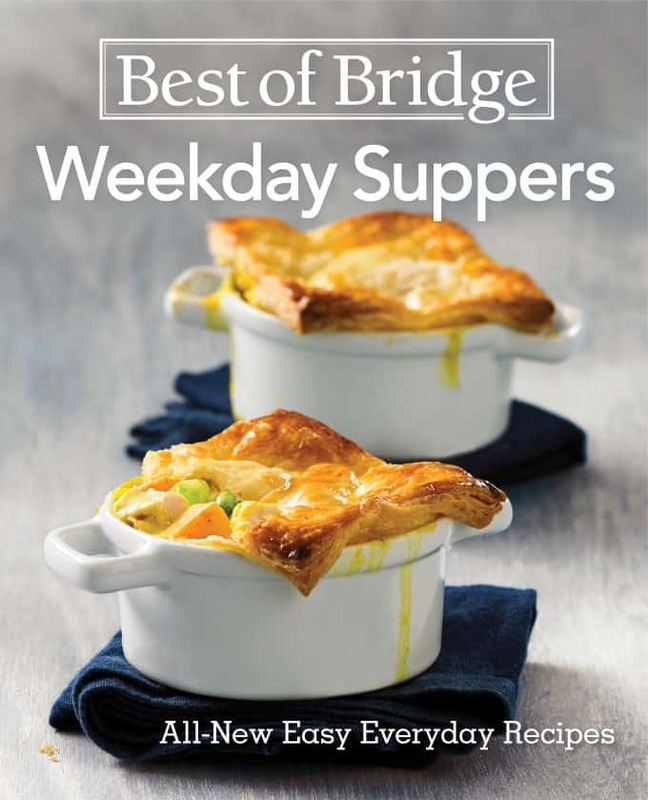 Best of Bridge Weekday Suppers by Emily Richards and Sylvia Kong. This amazing series has another best seller on their hands with 175 all new simple recipes with gourmet results for weeknight dining!! Recently I reviewed Best of Bridge Sunday Suppers for those special dinners that we love with the family. After Thanksgiving and Christmas you want to use up the leftover turkey in a whole new light. I love the curry touch to this turkey pot pie. It gives it so much flavor and brings it to a new level. This is pure comfort food and ready to pop in the oven in under 30 minutes. No fuss cooking as you don’t have to make your own pie crusts. You use a simple puff pastry crust on top with no bottom crusts needed. Making your own pie crusts would make this time consuming. 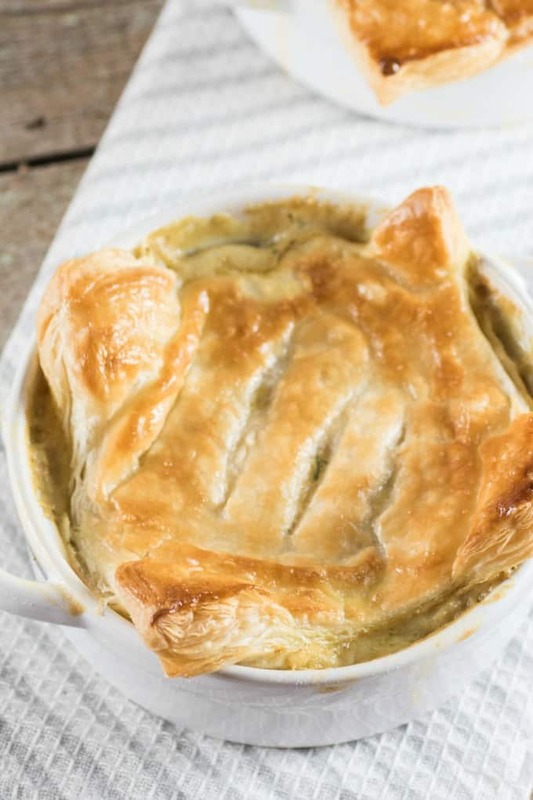 Plus, I love the flaky puff pastry even more with a pot pie like this. Puff pastry comes frozen so simply thaw and roll out to desired size. Nothing can be easier than that for pastry. I like that this recipe makes individual pies. It is comforting to have your own warm pot pie to yourself. Something that we all love! Best of Bridge Weekday Suppers will help you with the daunting task of what to make on hurried weeknights. This cookbook will show you a variety of quick-to-prepare meal options using international flavors plus familiar classic options. Most of the recipes you will probably have many of the ingredients in your pantry already. Using simplified methods like sheet pan cooking, pressure cookers and one-pot recipes Emily and Sylvia will help you streamline weekday meal prep. The cookbook is filled with delicious recipes like Vietnamese Beef Noodle Soup, Pasta and Grilled Veggie Salad, Steak Nachos, Caesar Pork Burgers, Savory Baked French Toast and so much more! 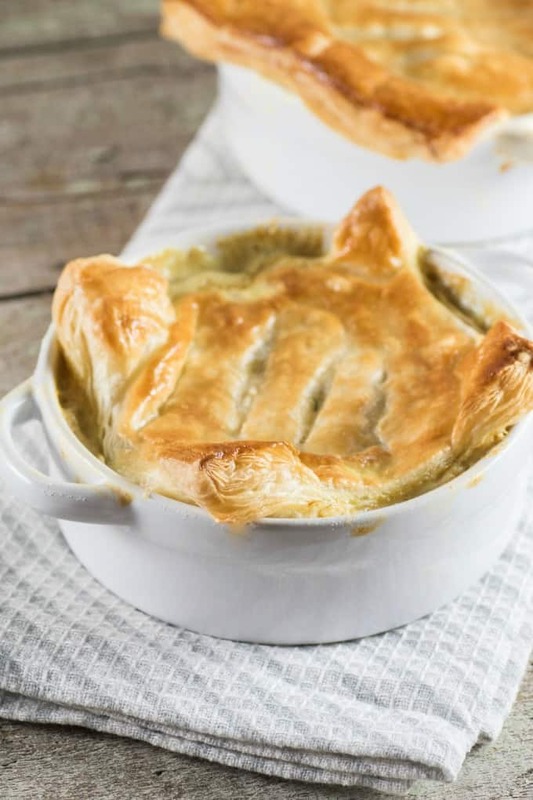 Recipes like this Curried Turkey Pot Pie will inspire home cooks to feel confident about meal prep. The recipes are simple and tasty and made from scratch. The cookbook also includes tips on ingredient shortcuts to help speed up both prep and cooking time. The Best of Bridge series has a faithful following as their recipes are tried and true. Emily and Sylvia are the latest recipe developers to the team and are dedicated to providing fool-proof recipes. 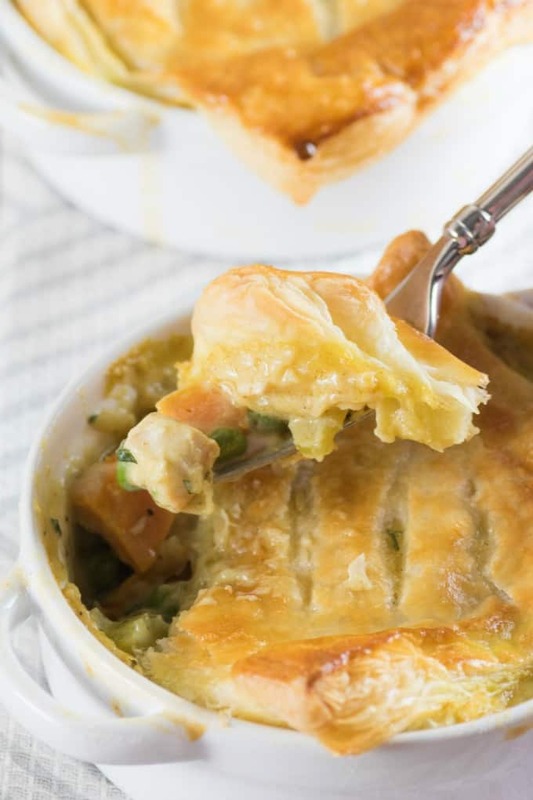 Making a pot pie is easy especially with leftovers that are already cooked. You just need to saute up your onion, celery, sweet potato and then add your flour and seasoning. Once that is incorporated you slowly add in chicken broth to make a sauce. Lastly you stir in turkey, frozen peas, cilantro and cream. Season with salt and pepper and this is your base. Once you roll out the puff pastry, you add the turkey and veggie mixture to ramekins and top with the puff pastry. It really is an easy meal to make. The lovely cream curry sauce is so fantastic with the turkey and vegetables. I love the change up with sweet potato too. I have one of these tucked away in the freezer for later. I can’t wait to have it again!! Enjoy this recipe for the holidays and beyond. It would be fantastic with chicken too! Emily Richards is a cookbook author, home economist, recipe developer, media spokesperson, television host, brand ambassador and blogger. She has a passion for getting people into the kitchen. She resides in Guelph, Ontario. Sylvia Kong is a home economist, food stylist, recipe developer and television personality. She is passionate about cooking and eating and is always trying out new recipes. Sylvia resides in Calgary, Alberta. 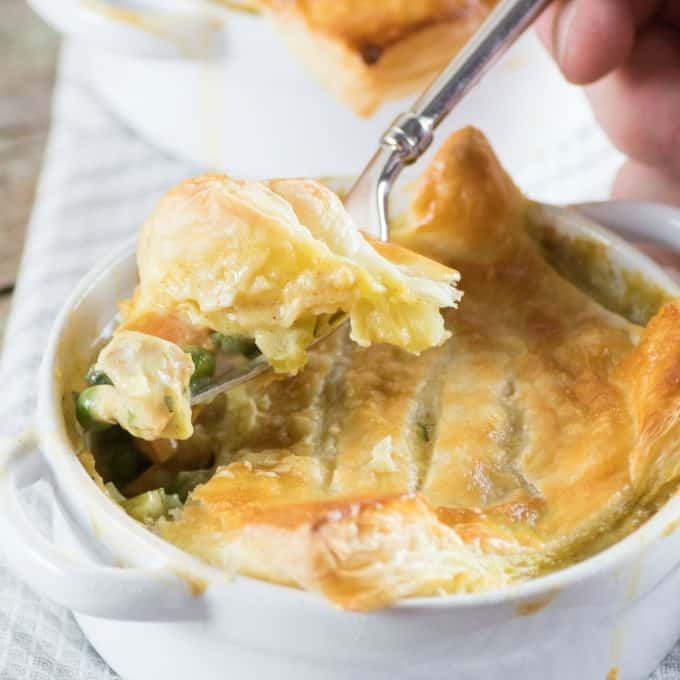 Pot pies are always a welcome comfort food meal, and store-bought puff pastry is a convenient and delicious way to get supper on the table fuss-free. Preheat oven to 425°F (220°C) and lightly oil six 1-cup (250 mL) ramekins. In a large pot, heat 3 tbsp (45 mL) oil over medium-high heat. Add onion, celery and sweet potato; cover and cook, stirring occasionally, for 10 minutes or until tender. Meanwhile, on a lightly floured work surface, roll out pastry into a 12- by 8-inch (30 by 20 cm) rectangle. Cut into six 4-inch (10 cm) squares; cover and refrigerate until ready to use. Sprinkle flour, curry powder and garlic powder over vegetables, stir and cook for 1 minute. Gradually stir in broth and bring to a boil. Stir in turkey, peas, cilantro and cream. Season with salt and pepper. Divide mixture among prepared ramekins. Place ramekins on a rimmed baking sheet, top each with puff pastry and gently cut 4 vents in each crust. Brush crusts with beaten egg. Bake for 20 to 25 minutes or until crusts are golden brown. Let cool for 5 minutes before serving. Tip: You can thaw puff pastry overnight in the fridge or on the counter for 45 to 60 minutes. Courtesy of Best of Bridge Weekday Suppers by Sylvia Kong & Emily Richards © 2018 www.robertrose.ca Reprinted with permission. Available where books are sold. Thanksgiving is so far away, but I already know I’ll be making this with the leftovers. That looks so good! I love this fresh take on an old favorite. I’ll be making great use of my leftover turkey this Thanksgiving. MmmMMM! I need to get my hands on leftover turkey this year. I would definitely try to make this. 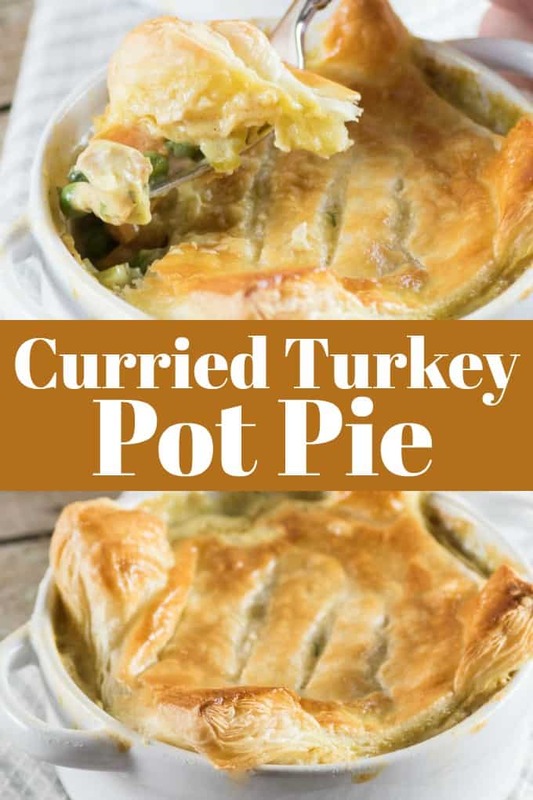 Made this with leftover turkey from an ‘English Thanksgiving’ and it was such a hit that we are making it year-round… sometimes with chicken, others with quorn for our vegetarian friends… we are even considering making it with coconut milk and Phyllo for our vegan friends! In the UK half and half is kind of hard to get, so I used buttermilk which was excellent and gave the sauce a nice tang. So glad you liked it. I thought is was a great recipe for using up turkey in a very creative and flavorful way. We really enjoyed it and will be making it again! !